Ron Woodroof (Matthew McConaughey), a homophobic electrician living in Dallas 1985, is told he has AIDS and is given 30 days left to live. Accompanied by a decrease in friends (due to them believing he obtained the diseases through homosexual behaviour), Ron begins taking AZT, a new drug believed to improve the health of AIDS victims. However, when his health deteriorates, Ron heads to Mexico where he is informed that AZT "kills every cell in the body". He is then given various other drugs, which drastically improve his health. Along with new found friend Rayon (Jared Leto), a transgender woman who also suffers from HIV, Ron begins importing and selling membership to his new creation; the Dallas Buyers Club. It's quite incredible to think that this is based off a true story. Dallas Buyers Club is undeniably a powerful film. There has been an unbelievably amount of hype surrounding this film, especially with regards to award season, with McConaughey taking almost every award he was nominated for. Leto too has been widely recognised. Much like some other films up for awards this year, Dallas Buyers Club rings with elements of award-bait; a film about a disease, with homosexual characters, taken from a true story. It's as close as they come. It's just a shame the film really didn't live up to that. By no means is this a bad film, it was just far from the film it should have been. McConaughey is terrific here. He really is. His turn as HIV diagnosed Ron is compelling from beginning to end, and we do believe his journey. However, this film is stolen by Leto. His performance as a transgender too suffering from HIV is extraordinarily good. His character is both more interesting and more entertaining than McConaughey's, and I actually found myself wishing the film followed Rayon's story (despite her being a fictional creation for the film's purpose). As far as I'm concerned, Leto can take that Oscar come March, but with the extremely tough competition in the Best Actor category, McConaughey is lagging behind. Perhaps this comes down to the fact that Dallas Buyers Club is a film with next to no emotion. I fully understand that this is a character study rather than a film layered with plot, but when certain characters die, and with such a heavy, hard-hitting topic as this, not once did I feel emotionally connected to a single character. 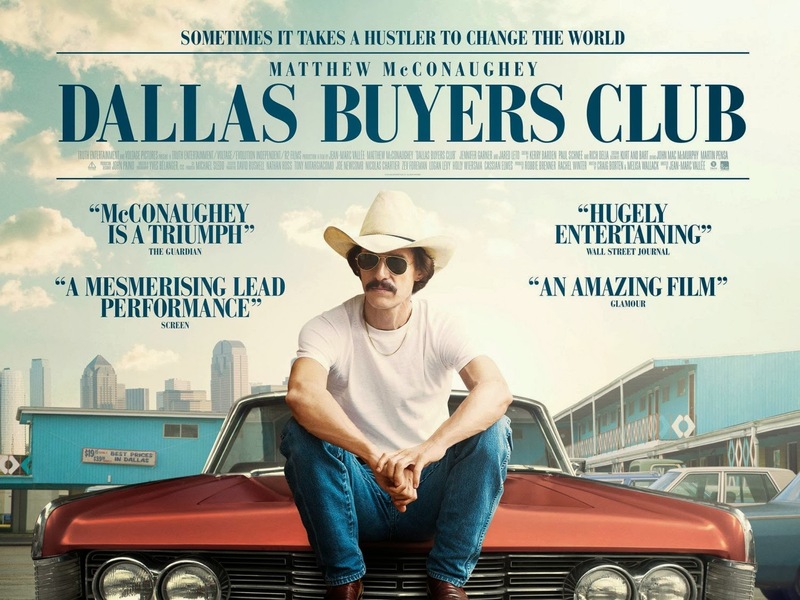 We understand their motives, we're given a solid amount of character development and we come to find interest in their stories, but whereas other award nominated films such as Philomena, Gravity and 12 Years A Slave have had a powerful emotional impact on me, Dallas Buyers Club didn't. Perhaps this was an intentional move from the filmmakers, but if so, it feels like a bad one. There is nothing here to suggest Dallas Buyers Club is a weak film. It is technically well made, with stunning cinematography and well developed characters, it just lacks emotion and any sort of humanity. With a topic so fundamentally human, it's hard to believe the film couldn't bring that across to the screen. At 116 minutes it even feels long; out of each nominee for Best Picture this year, this was the one I felt I needed to check the time the most, which is surprising when it's up against some near three hour films. The acting is incredible, and the screenplay is interesting, but there was just something missing here. Dallas Buyers Club is essentially a good film, but does it really deserve these various accolades and all this critical praise? I have now seen all of the nine Best Picture nominees, and this lies firmly at the bottom. It's a solid film, it just wasn't the film I had hoped for. To Summarise: Whilst occasionally lifeless and severely lacking in emotion, Dallas Buyers Club is nevertheless a well written character study, with strong performances from McConaughey and Leto.